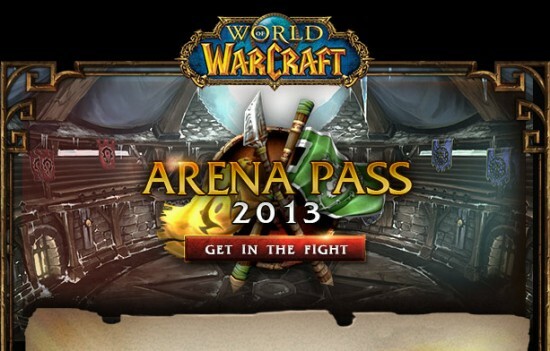 The 2013 World of Warcraft Arena Pass gives players a dedicated competitive environment based on the World of Warcraft Arena system. Players will be able create up to 11 level 90 characters per registered World of Warcraft account, each character will be based on one of a set of template characters with the ability to choose from some of the best items available in the game. You can set up your Arena team just like you would a normal PvP group in World of Warcraft, once created, you can compete with your fellow teammates in the special Arena Pass Battlegroup. Participating in at least 50 rated Arena Pass games on one character and with the same team will be eligible to receive the Armored Murloc pet. If you are a member of one of the top 1000 teams at the end of the rated phase and have participated in at least 100 rated Arena Pass games on a character on a qualifying team, you will receive the “Vanquisher” title for live characters level 71 and over. Have an active subscription to World of Warcraft with an account in good standing, e.g., not flagged or banned for any reason. Have a World of Warcraft account that has been upgraded to Mists of Pandaria. Have a valid credit card to pay the registration fee for the Arena Pass, which is $20 in North America and €15/£12 in Europe. Reside in a country or territory that allows participation (you will see the full list when registering). Complete the required information on the registration page to register for the Arena Pass. to clean the black soot off of the floors. Here are the guild quests along with a handy location and a listing of the reward for completion. Many thanks another spectacular write-up. Where by different might anybody obtain that style of information in this best method of creating? I’ve a powerpoint presentation following 1 week, and i’m on the find similarly info. Howdy, Cool article. There’s an downside to your web site throughout web explorer, might take a look at? Internet explorer ‘s still the marketplace boss plus a massive element of persons will leave out there magnificent crafting due to this challenge.